Now for operating temperatures of up to 60 °CAs a rule the use of drum pumps in explosion-risk areas is limited to ambient temperatures of up to 40 °C. Now, with the new combination of commutator motor F 460 Ex (HT) and pump FP 424 Ex S (HT), FLUX has pushed the operating temperature limit up to 60 °C (140 °F). ​This has been possible by adaptation of the design whilst at the same time retaining the familiar positive FLUX product characteristics. The motors now have the Ex designation II 2 G E EX De IIC T5 Gb and the respective pumps Ex II 1/2 G c IIB T3 each according to the applicable ATEX Directive 2014/34/EU. The impulse for this new development at FLUX was provided by an increasing number of inquiries for relevant Ex applications from the petrochemical, oil and gas sectors as well as from countries with higher natural ambient temperatures, such as those of the Middle East or southern Europe. Motor and pump will be presented to the world for the first time at the HI Technology and Industry Expo exhibition in Herning, Denmark from the 3rd to 5th of October 2017. Now with new process device in stainless steelVISCOFLUX mobile, the mobile and thus particularly flexible solution for pumping high-viscosity materials, is now available with a new process device in a stainless steel design. The fully rust-proof process device is extremely easy to clean and even able to be completely hosed down. It was developed to comply with the applicable hygiene requirements for the food industry: Hence all joints are welded and important details designed so that material is not able to penetrate, thus preventing any accumulation of contaminats in the first place. MINIFLUX, the pump for horizontal media transfer out of IBCs – now also for use in explosion hazard areas (Zone 1).The horizontally installed, extremely compact MINIFLUX container pump is now also approved for use in explosion hazard areas (Zone 1). It was designed for draining IBCs via their floor-level outlet and is an alternative to vertical immersion pumps. When accessing IBCs from above is impossible or very difficult, such as when containers are stacked or ceilings are low, the MINIFLUX enables pumping directly at the floor-level outlet. 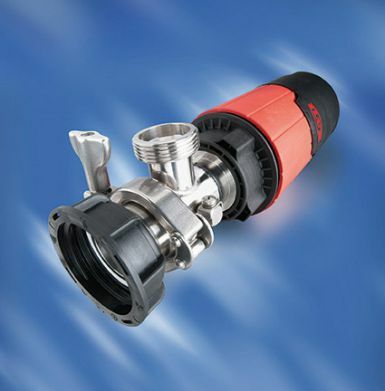 It is suitable for media with a viscosity of up to 1 000 mPas. In comparison to gravity draining via the IBC outlet tap the MINIFLUX enables a considerably higher delivery rate and delivery head. Depending on the media and motor, either up to 240 l/min can be transferred or a delivery head of up to 13 mwc can be achieved. This means that the media can be rapidly filled into the container or transported to an elevated container. The mechanical seal design separates the media area from the pump drive. This means the shaft only comes into contact with the product in the rotor area. The pump is only 136 mm long, weighs just 1.2 kg, is easy to handle and requires minimal space. It can be easily connected to the IBC with a union nut. Ideally the drive of the MINIFLUX is provided by a commutator motor or compressed-air motor. Now available as an Ex versionThe drum emptying system VISCOFLUX lite is now available as an Ex version. 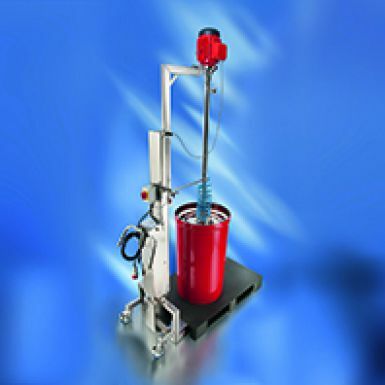 It is designed for higher-viscosity media which are just capable of flowing. The new explosion-proof variant is now suitable for use in explosion hazard areas of zone 1 and for pumping the most varied flammable media (zone 0/1). ​The Ex version of VISCOFLUX lite opens new opportunities across a diverse range of industries, such as chemicals or surface finishing technology. For example it is suitable for supplying machinery and fast-running plant with lubricating greases in zone 1. Alternatively it can be used for pumping zone 0/1 flammable media such as various base materials for paints and lacquer manufacturing as well as numerous coatings and fillers. Quick to install, conductive componentsContrary to the standard version of VISCOFLUX lite, the individual components of the Ex version (Ex-marking II 1 G IIB TX), pump centring plate and follower plate including process seal as well as the compressed-air hose are made of conductive or static dissipative materials. Comprehensive and precise potential equalization can be carried out over suitable connections for earthing wires. The system is quick to install, requires little space and due to its low build can also be used in working spaces with low ceilings. Residual volume in drum up to less than 1 %To continuously and gently transport higher-viscosity materials which are just capable of flowing, FLUX engineers use eccentric worm-drive pumps. In combination with a follower plate, a vacuum is created during pumping causing the follower plate to lower. In doing so the process seal of the follower plate hermetically seals the remaining material thus preventing unwanted emissions and changes to the product. Launch at the ACHEMA 2015The VISCOFLUX lite in Ex version will be available from the ACHEMA 2015. Come and visit us during 15. and 19. June at our stand (hall 8, stand E10) and convince yourself of the qualities of this drum emptying system. The new air-operated diaphragm pump FDM 07With the new air-operated diaphragm pump FDM 07 the Maulbronn pump specialist FLUX-GERÄTE GMBH introduces a particularly energy-efficient pump. It excels with a low air consumption. Furthermore, it convinces with a high flow rate, which is unique for such a small overall size. High flow rate and low air consumption for maximum efficiency During the pumping process the maximum flow rate of up to 20 l/min in conjunction with the low air-consumption provides maximum efficiency. What is more, contaminated media containing solids of up to 1.6 mm in size can be pumped without any problems. The suctionand pressure connections of the new design each have a hybrid internal thread (¼ NPTF,G ¼ ) and a ¾ NPTF external thread. This allows easy installation of the pump into existing processes and pipes. The Acetal conductive version is certified to ATEX Directive 94/9 EC for use in explosion-hazard areas. Thanks to an adapter plate the preceding model FDM 06 as well as other models can simply be replaced with the new FDM 07 air-operated diaphragm pump. the air-operated diaphragm pump FDM 07 which meets the greatest demands.By means of a patented air valve the FDM 07 convinces with its 100 % sure start-up from any position. The design ensures completely oil-free running so that no servicing unit is necessary. Since no oil mist is created, unhealthy working conditions and contamination of the working environment are avoided. An additional advantage is the low operating noise. The integrated silencer minimizes the generation of noise at the air outlet, thereby substantially reducing the noise level in the workplace. Indirect, non-contact volume measurement for FLUX eccentric worm-drive pump.The Maulbronn pump specialist FLUX-GERÄTE GMBH presents a bearing flange with integrated impulse generator for its eccentric worm-drive pumps. This allows indirect volume measurement to be taken without contact with the material, e.g. for use in the pharmaceuticals, food and cosmetics sectors. The hygiene-conform measurement guarantees a high reproducibility combined with a theoretical accuracy of +/- 1 pulse per measurement. The volume per impulse for pumps with an outside diameter of 21 mm is: 7.5 ml; for pumps with an outside diameter of 26 mm: 12.5 ml. In practice, factors affecting measurement accuracy are to be allowed for, such as: Viscosity, pressure, hose diameter, temperature, volumetric flow rate and wear. Also ideal for use with drum emptying system VISCOFLUX mobileThe indirect measurement method was especially developed for FLUX series F 550 and F 560 eccentric worm-drive pumps with bearing flange. It is not only an optimum addition to the 3A and FOOD versions, but is also suitable in all cases where frequent cleaning is essential. Combined with the drum emptying systems of the VISCOFLUX family it is the ideal measurement process e.g. for fats, tomato purée, caramel cream, Vaseline, or the base substances for manufacturing latex milk. Batch fills are also possible – via pulse transmission to an evaluation system.The IP 65 protection class certified bearing flange with impulse generator supplies four pulses per shaft rotation. For this purpose there are four magnets seated in the coupling each of which switches a reed sensor in succession. Every time this happens the nonsensitive low-maintenance sensor emits a pulse. This pulse can then be transmitted to an evaluation system. Final evaluation and control is made either via the electronic evaluation unit FLUXTRONIC®, a control cabinet or a stored program control system (PLC). This means that the bearing flange with impulse generator can also be utilized for batch filling. Furthermore the bearing flange, which is available in stainless steel, convinces with its compact design and details such as removable wiring or socket with cover. FLUX presents the first brushless battery motor to drive pumps. WithWith the FBM-B 3100, FLUX-GERÄTE GMBH presents the world's first brushless battery motor for pumps. The motor is designed for the small sealless COMBIFLUX drum pump. In combination with the pump, the motor provides a delivery rate which is extraordinary for this type of pump and guarantees the highest possible degree of flexibility in operation. ​Depending on the pump variant, flow rates of 12 to 60 litres per minute can be adjusted with the stepless speed adjustment. For example, at the highest speed, a 200 litre drum can be emptied within just three minutes. Using the lowest speed, even ten 200 litre drums can be emptied with just one battery charge. When the replaceable lithium ion battery has run flat, it can quickly and easily be exchanged and recharged within just 30 minutes. ​FBM-B 3100 battery motor — for even more mobility and flexibilityThe COMBIFLUX pump is especially suitable for transferring smaller volumes, e.g. out of narrow-openings and difficult to access containers. It is available in three variants made of the materials polypropylene, polyvinylidene fluoride or stainless steel. Due to the modular design, the FEM 3070 collector motor previously enabled different containers to be emptied one after the other with different COMBIFLUX pumps. The new FBM-B 3100 battery motor now provides even more mobility and enables new applications. Because its independence from mains electrical power supply this makes the FBM-B 3100 especially suitable for applications where cables are problematic or not desired, or mains supply is unstable or not available at all, e.g. outdoors. Granted the iF Product Design AwardThe new FBM-B 3100 battery motor has won the world-renowned iF Product Design Award 2014. German premiere in AprilThe new FBM-B 3100 battery motor is available now. Its German premiere will be in April simultaneously at Hannover Messe (hall 15, stand G43) and PaintExpo (hall 1, stand 1123). With the VISCOFLUX mobile, FLUX-GERÄTE GMBH has now succeeded in transferring high-viscosity materials from special sea container drums.FLUX customers from overseas, who purchase, for example, Vaseline from Germany, mostly receive this delivered in special sea container drums. The upwardly tapered drum edge and extended drum height ensure that the space for transportation in a 20-foot sea container is utilised optimally. Thus, 80 drums instead of 78 ISO drums can be shipped in just one of these containers. FLUX battery motor wins the renowned Red Dot Award: Product Design 2014The new FBM-B 3100 battery motor – the world's first brushless battery motor for pumps – has now won the renowned Red Dot Award: Product Design 2014. ​A record number of designers and manufacturers took part in this year's competition to impress the international panel of experts with the design quality of their products. The jury of 40 experts granted the coveted award for design excellence – the Red Dot Award - to only the best products. FLUX-GERÄTE GMBH is therefore even more delighted to have received this recognition. The same product received the equally well regarded iF product design award in 2014. German pump technology specialist FLUX-GERÄTE GMBH sets the course for the futureOn 24/10/2013 Herbert Hahn, Klaus Hahn and Martina Wilhelm (Managing Director and Owner of the family business) together with Maulbronn's Mayor Andreas Felchle and the architect Thomas Lins as well as Andreas Link and Stefan Dieterle of the building firm Geiger and the FLUX Operational Manager Jürgen Deeg carried out the ground-breaking ceremony for an additional warehouse. In the 1960s the Stuttgart-based FLUX-GERÄTE GMBH built up their own pump manufacturing facilities in Maulbronn. Since then the company has continuously developed itself. The range of products was extended vastly, the production appropriately enlarged, and areas such as research & development and sales & marketing were also established in Maulbronn. With the new extension works the company is now paving the way for further growth. Due to the always growing product range and the increasing international demand, greater storage capacity is necessary to ensure the high readiness for delivery typical of FLUX. 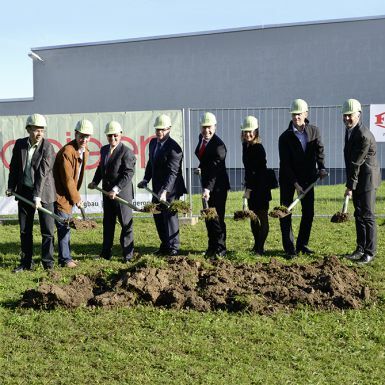 "The new warehouse is an important and necessary investment for us, which will help secure the expansion for the future", said the managing partner Klaus Hahn, to which he added, "we hereby clearly demonstrate our commitment to the Maulbronn location." In 1950, the world's first electric drum pump was named FLUX. In the meanwhile, the undisputed pioneer in the area of drum pump technology possesses outstanding know-howand experience in many other areas of pump technology. The comprehensive product spectrum now ranges from different pump types with motors, flow meters and accessories up to subsystems for plant construction and special system solutions. The internationally operating family company with its seven subsidiaries and numerous representatives delivers its products in more than 100 countries world-wide.